Patriot Platinum Insurance provides comprehensive medical insurance coverage for individuals and families traveling outside their home country. Within the PPO Network, this insurance plan pays 100% of the costs up to the policy maximum and pays 100% of costs outside the US after the deductible. Outside the PPO network, the plan pays 90% of the first $5,000 and 100% thereafter and offers travel medical protection including out-patient treatment, in-patient treatment, emergency services, emergency medical evacuation, and more. Patriot Platinum Insurance covers trips between 5 days to 36 months and allows visitors covered under the policy to visit any doctor or hospital within the PPO Network. 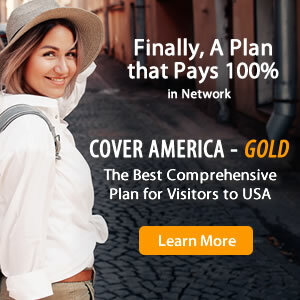 Patriot Platinum Insurance is best suited for senior or elderly international travelers visiting the US or another country outside their home country. How to Buy Patriot Platinum Insurance? Hi Anandbalaben, we are sorry IMG did not meet your expectations. We value your feedback and take concerns such as yours very seriously. Please note that IMG is required to administer our insurance plans in accordance with their terms and conditions. If you would like to continue this conversation, please email us directly. Still waiting for the check refund. takes so long. coverage of medical was good though. Hi Mark, we are sorry we did not meet your expectations. We value your feedback and take concerns such as yours very seriously. Although IMG will not discuss the details of claims in a public forum, we welcome the opportunity to further discuss your claim privately. Please contact us so we can continue the conversation.